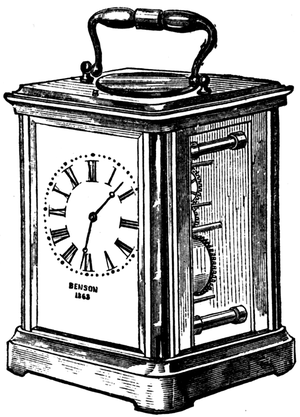 Carriage clock drawing from an 1875 book about time and time-tellers. Carriage clocks were designed to withstand the motion of road travel. They were often on the smaller size and enclosed in a protective leather covering. I like the lantern shape of these clocks. And, this carriage clock drawing shows a clock that lets you peek inside to see the clock movement – so cool whenever a clock or watch has that. The black and white clock drawing could be used as is or you could edit out the clock pieces to have a more lantern-ish light drawing. But, before you go to all of that trouble, you might want to check out our vintage lighting images too.